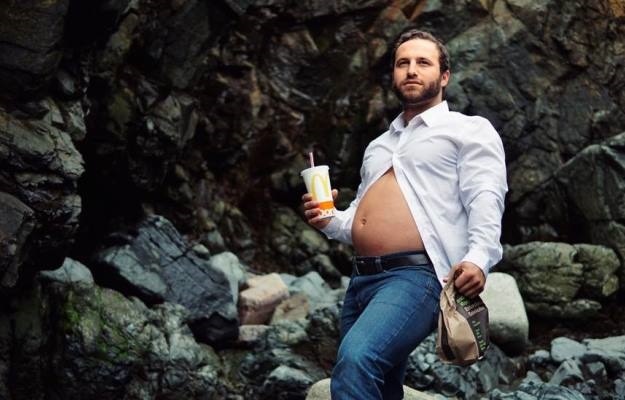 When Nick’s girlfriend forgot about a scheduled maternity shoot, he took the opportunity to show off his own baby bump. An enthusiastic father-to-be, Nick Roberts, showed support for his pregnant girlfriend by taking maternity photos – of himself. Hilarious pics of Nick, who lives in Boston, Massachusetts in the US, and his protruding belly were posted on Facebook and people lost their minds. The posts were shared more than 83 000 times, with many users adding to the hilarity by making jokes and writing messages of support. To create as much authenticity as possible Nick loaded up on McDonald’s burgers “to try to look a little pregnant”.